Developed in 1980s as a manufacturing technique, the evolution of 3D printing technology for consumer use within the last decade has widened opportunities forresearch and development within education. 3D printing provides users with the ability to explore and give form to conceptual ideas and models. As part of the research for a current exhibit at the Lowe Art Museum, Kay Pacha: Reciprocity with the Natural World, curator Dr. Traci Ardren collaborated with Dr. William Pestle, a faculty member in the Department of Anthropology, and anthropology student Adam Sticca to gain insight on how ancient Andean people made and used the art that would help tell the story of their lives 2,000 years ago. By creating a 3D replica of one such piece, an ancient Peruvian whistling vessel, the researchers were able to carry out intensive study of the artifact’s qualities in ways that could not have been done with the fragile original. The 3D print was created in Richter Library’s Digital Media Lab through CT scan images they provided to the lab. Carie Penabad (Associate Professor) assigned a project involving 3D printing within undergraduate course Architecture Design III (ARC 203). Students were provided the opportunity to give shape to 50 unbuilt villas by architect Claude-Nicholas Ledoux. A series of preliminary exercises was employed including: drawing preliminary sketches, making a small model (using mat board or chipboard), generating analytical diagrams and developing a 3D digital model with Rhino (CAD modeling software). The fabrications lab then printed the final models. In consequence, the physical models allowed the class to collectively compare and contrast subtle and sophisticated compositional variations. The DML provides 3D printing services to students, staff and faculty. Through a submission process, a user provides the file to the DML for review and a quote. Once the scope is confirmed, the DML will print the product for the user. Faculty who would like to learn more about using 3D printing can consult with a staff member in the Digital Media Lab. Led by David Tse, M.D., Professor of Ophthalmology at the Bascom Palmer Eye Institute in Florida, University of Miami researchers, Landon Grace Ph.D. (Assistant Professor) and Mauro Fittipaldi (Ph.D. student) developed an affordable process (facial scanning software and 3-D printing) to manufacture prosthetics for patients who have hollow eye sockets, following eye surgery for cancer or congenital deformities. Led by Ju Hong Park Ph.D. (Assistant Professor), Li Yi (Lecturer) and Christopher Chung (Research Assistant),workshops are provided on digital design and fabrication, providing students with hands-on experience with modeling software and using dedicated MakerBot 3D Printers. A 3D Powder Printer at the Fabrications lab Is also supported by a team of School of Architecture students for final, large-scale project outputs. Gemma Henderson: Senior Instructional Designer, Learning Innovation and Faculty Engagement, Academic Technologies. Samuel Montero: Multimedia Specialist, Digital Media Lab, UM Libraries. Morgan McKie: Multimedia Specialist, Digital Media Lab, UM Libraries. First coined in the mid-90s, 3D printing is the commonly used term for ‘additive manufacturing,’ the process of printing a 3D object from digital data.There are a variety of 3D printing methods and uses within almost every industry. Through computer-aided design software (CAD), a three-dimensional digital model is developed prior to the print. Once “sent to print,” the 3D printer builds the digital model into a tactile component by depositing (and fusing) thin layers of a material, in succession. Using CAD software, a 3D model is created (or adapted from an existing model). The CAD may identify issues such as structural integrity through a virtual simulation of the product. The machine is then set up according to material or platform requirements. By modifying the file settings for the selected 3D printer (and potentially the computer that operates it), the model is made “print ready” and then sent to the printer. Printer-type nozzles dispense the selected material onto platforms, following the design data, layer by layer. As the process can take hours to days to complete, depending on the volume of the product, occasional monitoring of the printing is required, to identify issues. Once removed safely from the printer, the product often requires post-processing, such as removal of powder, or setting materials to fuse the structural integrity of the product. 3D printing has flooded the professional, government and higher education industries within recent years. In product liability cases, lawyers demonstrate how a product was meant to be made, to make courtroom evidence tactile. In fashion, designers are creating new textiles for the runway. Musicians are prototyping new instruments, while gaming enthusiasts can expand terrain in tabletop board games. Art activists are replicating artifacts in areas of conflict, prone to destruction, to protest for the preservation of these pieces. Rapidly evolving into an interdisciplinary tool, 3D printing technology provides a new direction for individuals to cost-efficiently develop, customize and rapidly prototype components to support envisioned projects. While proficiency with computer-aided design is recommended, students, educators or researchers in any discipline can download existing 3D digital models from user-generated websites, or capture a real-world object using 3D scanners, to manipulate and produce a 3D printed piece to complement a larger project. During Spring 2016, at the School of Communication, Interactive Media student, Taylor Gandolfi produced 3D printed pieces from the open source InMoov project, for a voice controlled robotic hand prototype for the Capstone course (CIM 691). CIM 691 was designed to demonstrate a student’s accumulated training in Interactive Media in a single original project of their choice. At the College of Engineering, students can proof their idea and rapidly prototype working components within the prototyping facility using an industrial 3-dimensional thermoplastic printer, while electrical and computer engineering researchers utilize a consumer-level 3D printer to quickly prototype components within a dedicated lab. 3D modeling an imagined object is perhaps the hardest obstacle to overcome. 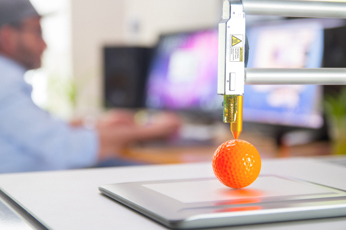 Individuals require a basic level of digital competency in 3D modeling software to manipulate, render and produce a file format that is acceptable for a particular 3D printing method. As the printing process can take at least 3 hours, issues are often not discovered until the object is printed. A key concern with the use of 3D printing is determining the intellectual property law that protects a 3D printed creation. Currently, the rate of the development of 3D printing technology is faster than the implementation of legislation to protect 3D products, therefore Creative Commons licensing, intellectual property platforms and white papers are determining best practices. The start-up costs to purchase and maintain a 3D printer for personal use (including materials) is still an expensive investment. In addition, less sophisticated 3D printing models often mean accuracy and size of the final prints are compromised. Technical support is sometimes underdeveloped for when 3D printers malfunction and need quick troubleshooting and repair. Access to 3D printers is increasing through online printing services, retail spaces and higher educational facilities, promoting further customization of end products. Advancements in the materials used for 3D printing allows further applications of this technology. 3D bioprinting uses “bioink” to create tissue-like structures, including skin or heart tissue, and potentially could print organs, eliminating the need for donors. 3D food printers can personalize diets and use alternative ingredients, particularly for individuals who may suffer from allergies, chewing or swallowing difficulties.3D printers using paint-based UV ink can simulate the height and texture of painting, based on digital data, and print new artworks of late artists, such as the Dutch painter, Rembrandt. NASA are also continuing to explore 3D-printing methods to build a habitat from indigenous materials, for space exploration. Self-directed learning: According to the New Media Consortium 2016: Horizon Report (Higher Education edition), the concept of ‘makerspaces’ are emerging across higher educational institutions, to provide further access to 3D printers, 3D modeling applications and other do-it-yourself products, such as the computer, Raspberry Pi. Makerspaces provide a workshop environment for users to engage in hands-on, autonomous activities and foster creative inquiry. One step towards this concept is the Digital Media Lab at the University of Miami, that provides a computer lab for students to work on 3D modeling projects. The growth of these spaces are therefore important in supporting creative problem-solving, higher-order thinking, and the research and development of 3D printing. Scaffolding instructional approach: As explored in ARC 203, and the School of Architecture’s workshops, a scaffolding, project-based approach allows students to gradually master the skills to produce a 3D printed product. Universal design: Using 3D printed models within the classroom, students (including visually impaired learners) can physically touch visual assets (such as a diagram) used in classroom instruction, and gain a tactile understanding of the concept. In particular, learners can process complex information through closer analysis of the 3D printed object. Learners could potentially analyze historic artifacts, explore anatomical and molecular structures or evaluate student generated prototypes. 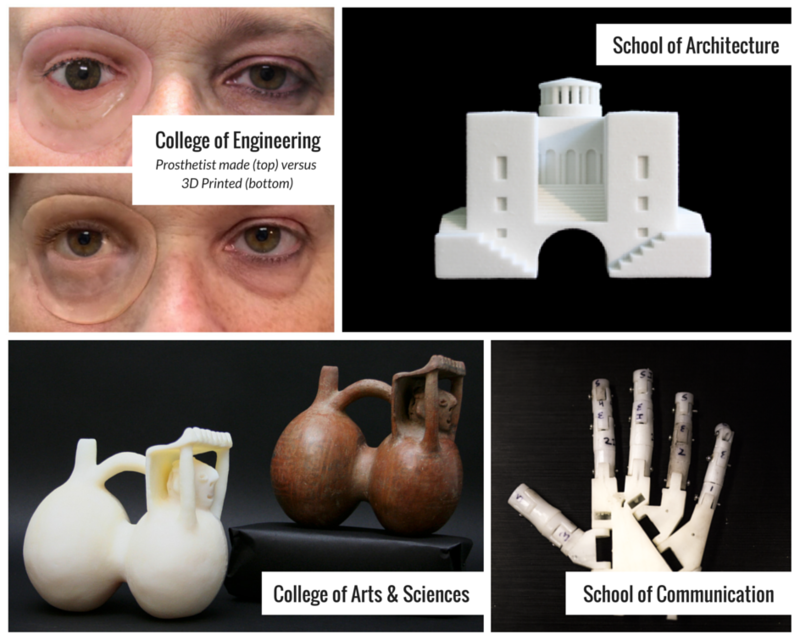 Social and collaborative learning: For basic use, user-generated content websites (Thingiverse, NIH 3D Print Exchange) allow a learner to 3D print from an existing model and crowd-source instructional guidance through dedicated forums and use cases.